If you have two different networks and you don’t want to install a DHCP Server on each side you can use “DHCP Relay Agent” Service. Should have two Network cards. For each network one. Right Click on General in IPv4 and choose “New Routing Protocol” and there you can finally choose “DHCP Relay Agent”. 10. 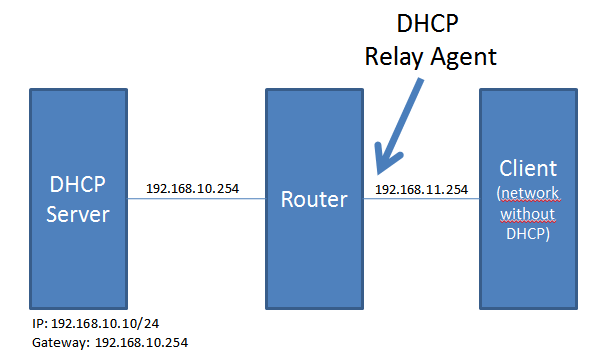 Right Click on” DHCP Relay Agent” and choose “Properties”. There you add your DHCP Server. In this case it would be 192.168.10.10. 11. Add the Network B Interface to the “DHCP Relay Agent”. 12. You should be done. In Windows 2008 it’s possible that you need to make adjustments to your Windows Firewall. 13. You can test on your client to get an IP Adress. Run from the command console: Ipconfig /release and Ipconfig /renew. After that you should be able to see the IP address if you type: ipconfig.